Here are some of the Top PR stunts from 2016. How did I decide? Just the ones I liked! 1. Instagram – Made a fake account getting more than 50,000 likes in only a few months. They created a person called Louise who posted lots of photo’s from parties, on yachts and basically lots of fine dining and drinking. It was a campaign to promote how easy it is to fall into alcoholism. 2. JetBlue – Not sure if I would like to be on this flight, but passengers were given discount for flights every time a baby cried. It was a PR Stunt for Mother’s Day. It was of course done in America! 3. Ghostbusters PR stunt – To launch the new movie with an all female cast they installed a Giant Stay Puft Marshmallow Man in the middle of Waterloo Station. They also installed a shop which looked like a New York Subway entrance and flyers were giving out to tempt commuters to calling a secret number. 4. The London Games Festival – They installed a Giant Monopoly Board right in the middle of London’s Trafalgar Square. The public were encouraged to play the game which had all the dice and playing pieces. 5. 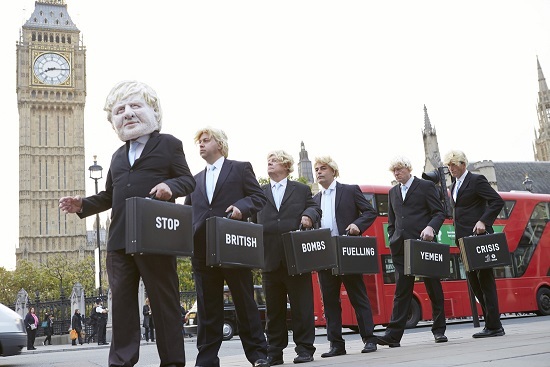 A personal favourite is the Boris Johnson PR Stunt by Oxfam. Oxfam wanted to get a political message across (see the photo) and poke a bit of fun at Boris too. They enlisted the help of a PR company who hired actors from PR Staffing agency Envisage PR Staff, who provide staff to PR Companies and Media Houses. The six Boris look a-likes were papped across London.